"Postcard (Linen) - Chanute Air Force Base, Illinois - Circa 1945. " 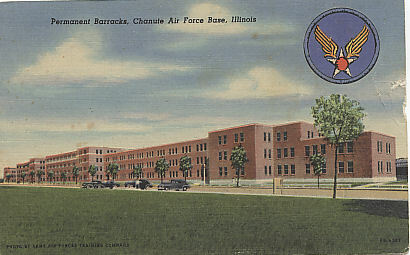 (1843) Postcard (Linen) - Chanute Air Force Base, Illinois - Circa 1945. -Condition: Good Picture of Permanent Barracks. Prior to its closing by BRAC in 1993, Chanute was one of the oldest facilities in the United States Air Force. Chanute Field was established on May 21, 1917, being one of the initial World War I Army Air Service installations. There is small tear on upper right side. Card measures 5 1/2" by 3 1/2". Price: $4.00 +shipping.